Water Pump and Tap Kit. The Next Generation SHURflo pumps guarantee quiet operation and smooth performance while providing the ultimate in durability and reliability. Designed and built specifically for the harsh marine environment, SHURflo pumps are equipped with sealed switches and seamless e-coated motors. Multi-fixture marine fresh water installations, this pump may be used for general fresh water transfer, intermittent duty. Thermally Protected, CE Certified, Ignition Protected ISO 8846. 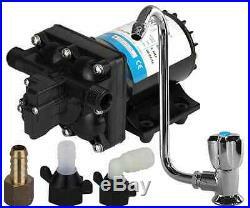 1 x 239340 - Shurflo Aqua King II freshwater pump. 1 x 23963 - 1/2" NPT - 1/2" straight tail. 1 x 23966 - 1/2" NPT - 1/2" elbow tail. 1 x 51014 - Single right tap and faucet. 1 x 51017 3/8" - 1/2" tail. Flow Rate: 11.35 LPM (3.0 GPM). The item "Caravan Water Pump and Tap Suits Drifta Kitchens as well / Pump / Faucet Kit" is in sale since Tuesday, July 26, 2016. This item is in the category "Vehicle Parts & Accessories\Caravan Parts, Accessories". The seller is "ulublu" and is located in Online Store. This item can be shipped to Australia, all countries in Europe, all countries in continental Asia, United States, Canada, New Zealand.